Whatever the question-watching this movie is always a good answer. It's a classic. (Yes, seriously, I believe that is!) Man, how I loved Chris Farley. He and David Spade in this movie are comedic heaven. Back in the day, I made my mom watch Tommy Boy with me. She didn't particularly think the movie was that funny, but she thought it was really funny watching me watch the movie. Anyway, last week was a bit of a rough one with Elizabeth, more on that later, and I needed a good laugh. 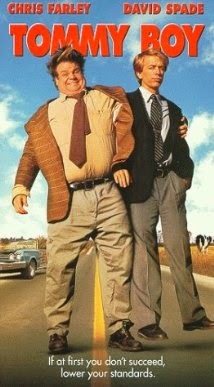 Luckily, Tommy Boy never disappoints. Tommy: I l-left a message. Richard: A message? What number did you call? Richard: I can't hear you, you're trailing off and did I catch a niner in there? Were you calling from a walkie-talkie? Tommy: No, it was cordless. Richard: You know what? Don't. Not here, not now. Richard quizzing Tommy before they go out to try and make a sale. Richard: What is our carrying charge for all the merchandise in the warehouse? Tommy: ...half percent. I knew that. Why can't I remember it? Richard: Try an association like, uhhh... Let's say the average person uses ten percent of their brain. How much do you use? One and a half percent. The rest is clogged with malted hops and bong resin. Richard: [after Tommy explodes in a client's office] That guy may not call us. Tommy: I can't believe he called me a psycho. Richard: Hey, were you in there just now? You are a psycho... Good God. And comb your hair. Tommy: Did you hear I finally graduated? Richard: Yeah, and just a shade under a decade too. All right. Tommy: You know a lot of people go to college for seven years. Richard: I know, they're called doctors. Richard: Oh that sounds good: melted chocolate inside the dash. That really ups the resale value. Tommy: I think you'll be okay here, they have a thin candy shell. 'Surprised you didn't know that. Richard: I think your brain has a thick candy shell. Tommy: Your... Your brain has the shell on it. Richard: Hey... I was just thinking... when we stopped for gas this morning I think it was you who put the oil in. Tommy: Hey if you're going to say I didn't put the right kind in, you're wrong. I used 10-W-30. And besides, motor oil would have nothing to do with this accident. Richard: True. But you can't latch the hood too well, IF YOU DON'T TAKE THE CAN OUT, YOU NO-SELLING WASTE OF SPACE. Richard: I swear to God, you're worthless! Richard: You have a window! And why shouldn't you? You've been here ten minutes. Now, picture Chris Farley in David Spade's blue blazer doing "fat guy in a little coat." Chris Farley, you are missed!